Please bear with me—this post requires a wee bit of audience participation, if you will. Look at the picture [enlarge it, if you like] and squint just a little, so the details blur and you are concentrating on the colors. 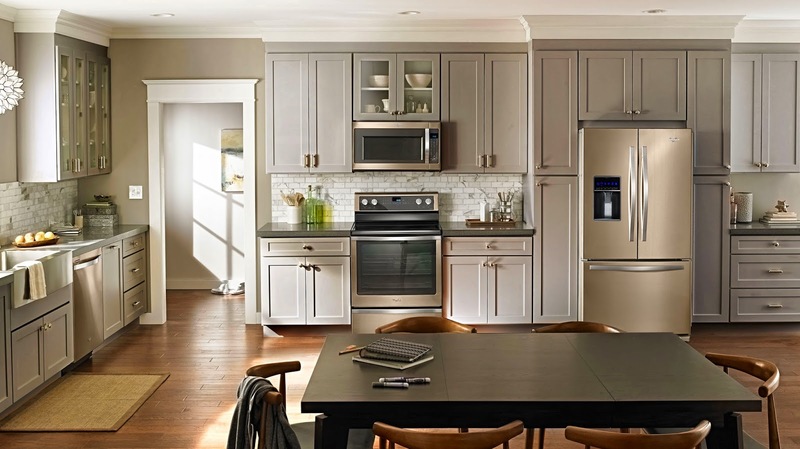 Hone in on the appliances, and you'll see they are the subtlest shade of gold. When I had the good fortune to preview this collection, it was a revelation to see the delicacy of tone that had been achieved in stainless steel. Dubbed 'Sunset Bronze', the color is chameleonic, compatible with virtually every material and hue in the spectrum. If you're bored with ubiquitous silver stainless, this is my pick for a viable, non-faddish alternative.